Collect Bonus Cards on the exclusive Blackjack tables! To celebrate Black Friday, Betsson Casino and all other brands in the Betsson Group are giving you the opportunity to win extra on our Exclusive Blackjack Tables. Simply sit down this weekend on any of the eligible live tables at Betsafe Casino, Betsson Casino, Casino Euro, NordicBet Casino or Mr. Smith Casino and you could be dealt on of the hundreds of bonus cards that are added to each card shoe. The value on the cards ranges from €20 to €100 and are instantly credited in cash. 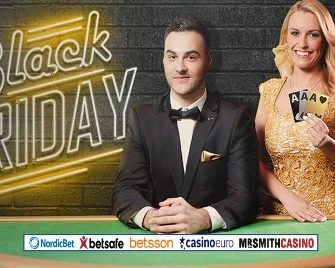 Hit the live casino tables on Black Friday weekend for a very special treat from 23rd to 26th November 2018 at any of the Betsson Group casinos – Betsafe Casino, Betsson Casino, Casino Euro, NordicBet Casino or Mr. Smith Casino. Join the dealers on the eligible live casino favorites and play for cash rewards. All prizes are credited in cash, no wagering requirements. Terms and conditions apply. The campaign is active from 20:00 to 23:59 CET every day during the promotional period. Special bonus cards will be added to the decks on all exclusive blackjack tables – Exclusive Blackjack 1 to 12 and VIP. Minimum bet to qualify for the campaign is €5.00 in cash. Players getting dealt the bonus card will have the amount instantly credited without wagering requirements. The value of the bonus cards added to the card shoes is based on the minimum bet on the table. Launched in 2001, the casino is operated by BML Group Ltd. and holds MGA Malta and UK licenses. Betsson offers Sportsbook, Poker, Bingo, Scratch Cards, Games, Casino and Live Casino with games from acclaimed suppliers such as Netent, 1×2 Gaming, 2BY2 Gaming, Ainsworth, Aristocrat, Bally, Barcrest, BetDigital, Big Time Gaming, Blueprint Gaming, Core Gaming, ELK Studios, Fantasma, Foxium, Fuga Gaming, Game360, Games Lab, Gamevy, Games Warehouse, Inspired Gaming, Iron Dog Studios, iSoftbet, Jadestone, JustForTheWin, Leander, Lightning Box, Meta GU, Microgaming, NextGen, Novomatic, NYX Interactive, Old Skool Studios, ONgame, Play’n GO, Pragmatic Play, Push Gaming, Quickfire, Quickspin, Rabcat, Realistic Games, Red Tiger Gaming, Scientific Games, Sigma Gaming, StakeLogic, Thunderkick, Williams Interactive and Yggdrasil. The LIVE Casino tables are powered by Evolution Gaming, Extreme Live Gaming and NetEnt Live. Betsson – Da Vinci’s Live Casino Race!